Ownership is a key theme in composition workshops for me. When participants feel a sense of ownership over the music they are playing, they commit to it in a whole-hearted and quite serious way, and that commitment shows in the sound, the focus, and the body language of the player. I’ve recently returned from a 3-day composition project in Carnarvon, Western Australia. The project was the education component of the Australian Chamber Orchestra’s Reef Project, which brings together musicians, surfers and film-makers for an extraordinary collaboration, in partnership with Tura New Music. The composition project involved a team of ACO musicians, guest artists, and 32 young musicians from Carnarvon and Geraldton – small towns halfway up the coastline of Western Australia. Working as a large ensemble and in small groups, we composed a series of original works inspired by the spectacular coastline in that part of the world, in particular Gnaraloo Reef. It was the first time that any of these young players had been part of a process like this. They were open and curious, and as the project took its course, their confidence in what they were creating increased. However, it was on the third day that we saw the most transformational change. 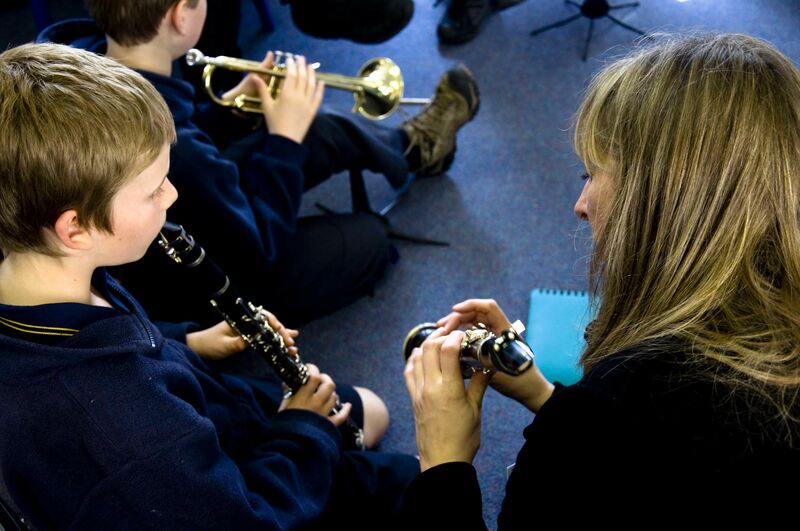 I’d invited a further group of 30 younger beginner musicians to join the project on the last day. They were to spend the last hour of our rehearsal with us, learning parts to play in that afternoon’s public performance of the newly-created work. I sent the new players (who were generally a few years younger than the ‘main band’ we’d been working with the previous 2 days) to stand behind one of the more experienced players playing the same instrument, and asked the ‘main band’ players to teach the newcomers what to play in the sections of music they would be joining us on. Perhaps this was the most powerful moment in the workshop for some of them. Perhaps it was only at this point that they realised what they’d achieved. They already felt a strong sense of ownership of their music, but they had no real-world context for it at that point. Teaching it to someone else was a powerful and authentic validation. In that moment, they transformed from well-meaning kids who try, to composers and makers of their own music. The energy shifted and the performance moved to another level from that point on.